This is for all of you who live in the Northern Hemisphere and are feeling a little cold. Do try making this soup it isn’t as hard as it looks. Take the time to read through the recipe as well as the Cook’s Tips. They are my suggestions to make a few tasks easier. If you are vegetarian, just leave the meat portion of the recipe out. You will still get a lovely aromatic vegetable broth. In a large heavy base pot add your oil, shallots, pork ribs or pork cutlet/chop. 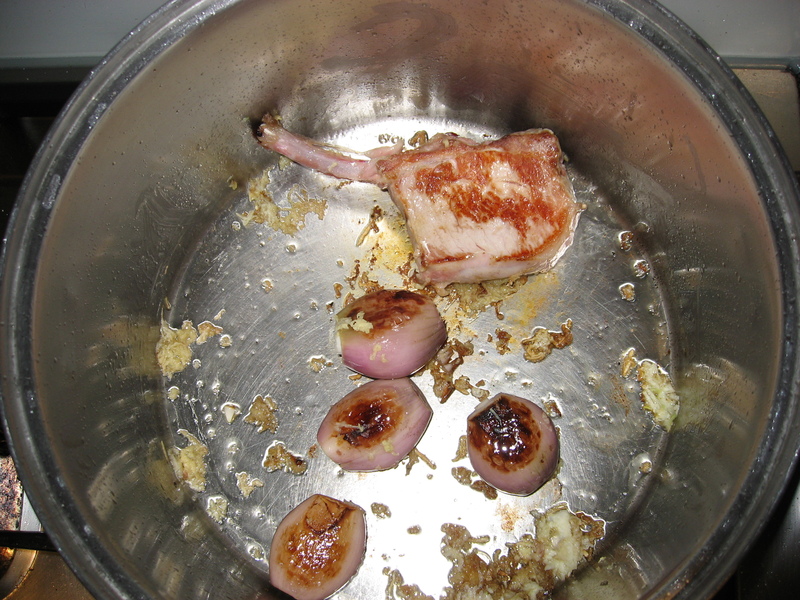 Start sizzling on medium heat the shallots and pork. When looking browned add the grated garlic and ginger. Keep stirring with wooden spoon so that the garlic and ginger brown a little but ensure that they don’t burn. For approximately 1 minute. Add the chicken to the pot and then add the water. At this stage you will see how much water you will need. Allow the chicken to be a little exposed. This really depends on size of your saucepan/pot. Then add the spring onion, coriander sprigs, carrot, cinnamon sticks, kaffir lime leaves, star anise and pepper corns. Place the lid on top of the pot and bring to boil. Reduce the temperature and simmer on a lower heat for 1 1/2 – 2 hours. Whilst simmering skim any impurities that form around the edge of the pot. This will give you a clearer broth. Half way or towards the end of cooking add the salt gradually and see if it’s to your liking. Allow to simmer for a little longer. 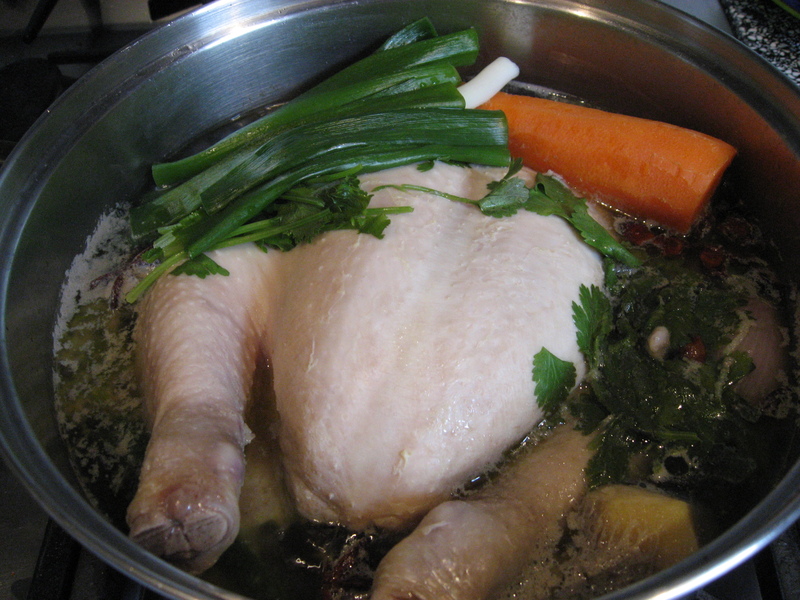 Remove the chicken from the pot and allow to cool. Remove the all the vegetables from the pot as well as the spices. I get another pot to strain the chicken stock and use a fine metal strainer or sieve. Once you have strained the liquid allow to settle and spoon off the fat that forms on top. Leave a little bit of fat in the broth this gives the stock more body and flavour. Place the pot back on the stove with the clear broth and simmer gently until ready to serve. Once the chicken has cooled and can be handled remove the skin and shred the meat into fine pieces and place in a clean bowl. You will find that the meat comes off the bone easily. Wash bok choy, Chinese broccoli, and allow to strain. Once strained cut into small pieces. The spring onion, coriander cut into thin pieces and the Spanish onion thinly sliced. Place a pot on the stove with 2 litres of water and bring to boil add the noodles and cook until just soft. Strain noodles in a colander and rinse with cold water. To serve get an Asian soup bowl and at the bottom place a small handful of noodles, then add a small handful of bok choy and Chinese broccoli. Add a handful of shredded chicken, sprinkle spring onions, coriander and a few thinly sliced Spanish onions. Ladle the broth into the bowl. I add a little bit of pork as it adds more flavour to the stock. I find that it’s a bit richer and my family have certainly advised me on that. I have experimented with just chicken I find that the broth is much lighter. When a little bit of pork is added the flavour is stronger. Feel free to experiment with the different types of meat bones such as beef. You will most likely get an even more intense flavour. You can char grill your shallots over a gas flame to caramelise them. I do it in a pot all together as it saves me time. In Vietnam they char grill them as well as the pork and they get that lovely smokey flavour. You could even roast some of your bones as this will also add an extra dimension to your stock. There is a good deal of bok choy and Chinese broccoli left over and I pack it up and place it in the fridge to use a day or so later. I add the greens to a stir fry. It could be used in a vegetarian or or meat stir fry dish. I generally don’t waste anything, I make another meal from all the little bits and pieces that are in the fridge. I usually have two pots simmering away and I use 2 free range chickens. I always have extra stock in the fridge or freezer to use at a later date. 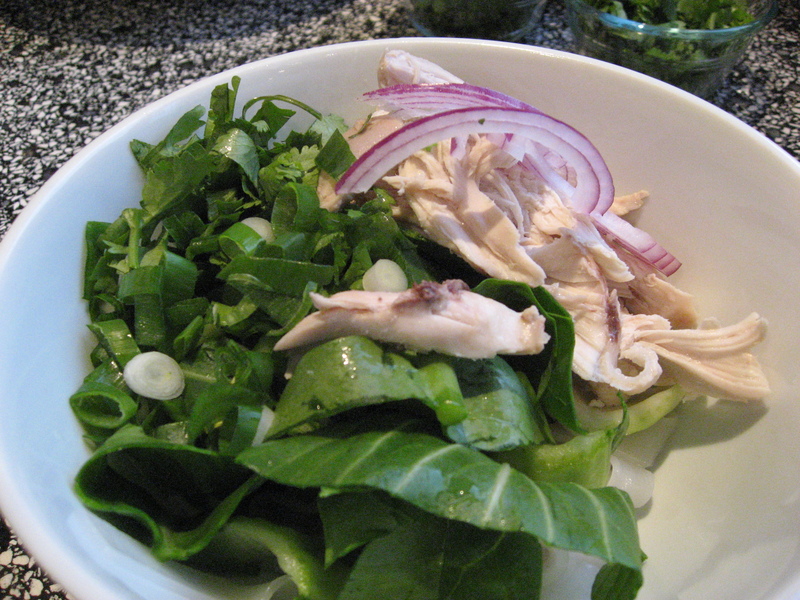 The chicken, once shredded is placed in the fridge for sandwiches or salads. I have even used the meat in a stir fry with the bok choy and Chinese broccoli. The next day when having the chicken in a sandwich or salad you will notice the aroma and flavour it gets from being cooked with star anise and cinnamon sticks. It’s lovely! Once you make your own chicken, vegetable, beef or fish stock you will find you will favour making your own. Whilst the stock is bubbling away on the stove for a couple of hours I do other things. If you make a big batch of stock you may not need to do it for a while. I store it in containers and freeze some and also place a bit in the fridge to use during the week. However, I do not leave my stock in the fridge for more than 5 days. I have even used the above stock to make a Risotto. It works beautifully! With cooking the possibilities are endless as long as you enjoy the flavours and textures. Do not be afraid to experiment. Eastern flavours can meet Western flavours. Thank you for your comment and also for nominating me for the Liebster Award. I’m still learning to navigate around the blogging world and would love to answer your ten questions. However, I need to ask for assistance from my young mentor/guide who will I’m sure know what to do. I will be in touch and definitely follow up on the questions. Ooh I am going to add that to my list of recipes. I really enjoy cooking and the more involved the process is the more I like it and I’m always on the look out for something I haven’t seen before. Thanks for sharing – will be back and will be taking notes.